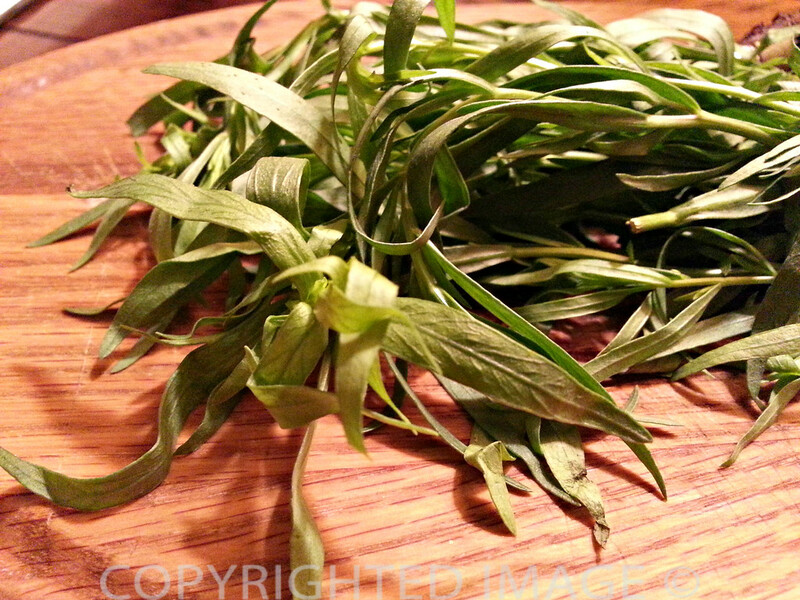 Tarragon (Artemisia Dracunculus var. sativa) – With it’s peppery anise like flavor, French tarragon plays a predominant role in French Cuisine. Works well in salad dressings, to season spring vegetables and in the cream sauce for my easy French Tarragon Chicken recipe. At home in France, and as far back as I can recall, a green salad was part of every meal. The vinaigrette dressing varied with the greens – sometimes there was a small teaspoon full of added Maille© mustard, sometimes shallots, more often than not it was fresh tarragon and always parsley. My grandmother would send me into the potager to pick fresh vegetables and herbs, particularly parsley and tarragon. Every day. 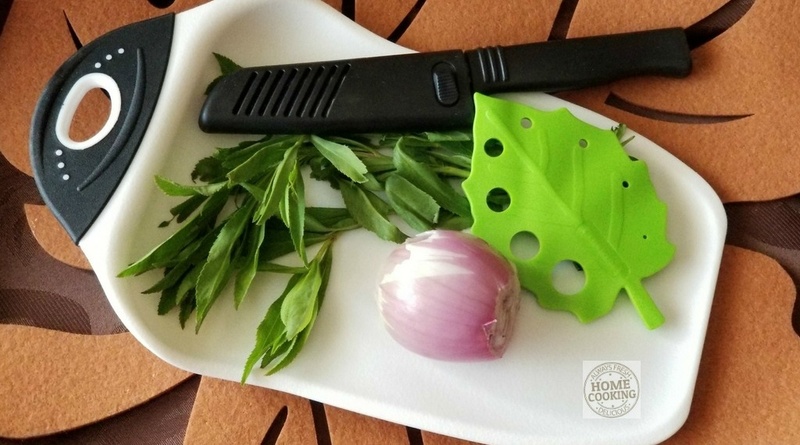 I strip the tarragon leaves from the stems using my dishwasher safe stripper. Love the fact that it can easily strip a variety of leafy greens from tiny herbs to larger greens such as kale! Wash it off and pop it back in the kitchen drawer. It’s one of those small gadgets that make quick and easy work out of an otherwise frustrating job – stripping leaves off tiny twigs. Once you’ve stripped the leaves, they can be cut very fine (with kitchen scissors the way Grandmère did it) or use an hand blender to chop into tiny bits as you emulsify the dressing. But I digress – Time to prepare for our lobster fest. Here I am prepping for a fresh lobster dinner – a combo of typical Cape Cod fare and French style menu items. My plan is to prepare aïoli mayonnaise and vinaigrette for the same meal. Aioli as a dipping sauce for seafood is quick to prepare with a stick blender. Unfortunately, my stick blender is not where I last stored it and I do not own a pot large enough to cook several lobsters at one time. Every Home Chef Needs A Hand Held Blender! Immersion blenders are a relatively new addition to my kitchen paraphernalia but I now find them indispensable. Like another pair of hands when it comes to cooking. My cousin-in-law is bringing fresh lobsters from the Cape and all she asked for was a huge green salad prepared the way she remembers them from frequent trips to France. Not only do I need a lobster pot but I felt I could also find a good deal on a replacement blender. Home Goods® delivered the goods…again. The store has never let me down. I found a top rated immersion blender. It went from the store to the kitchen and from there, straight to work. In fact, it made light and speedy work of both the mayonnaise and the salad dressing. Top 10 Vinaigrette Recipes: Balsamic, Raspberry, Citrus, And More! Leaves stripped off two twigs of fresh tarragon. The proportion I use for a basic vinaigrette is always 1 of vinegar to 4 of oil for a green salad (just lettuce). My Maman and sister prefer a 2 to 3 ratio but it really depends not only on the type of lettuce used and any add-ins such as tomatoes and cucumbers. I use my large salad spoon as a measuring recipient. For this purpose, I simply eyeball it in the beaker but the graduated cruet (with several pre-measured recipes) makes it super easy to prepare healthy salad dressings at a glance. Add the salt and pepper first, then add the vinegar and allow the salt to dissolve a bit. Add the slivered shallots, the tarragon leaves and then add the oil. Carefully lower the immersion blender into the beaker and blend on low power until completely emulsified and both the shallots and tarragon have been reduced to small bits. Adjust seasonings. 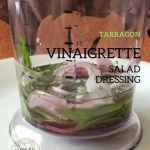 Do not add the vinaigrette to salad greens until just before serving. When ready to serve, toss well to coat all greens. Salad dressing shakers are great when you prepare a batch of simple oil/vinegar vinaigrette to last all week. Add any tarragon, chives, parsley, shallots and any other fresh herbs to lettuce mix. The resulting flavor will not be as intense as if the herbs were blended into the oil and vinegar. Many recipes add sugar to the salad dressing ingredients. NOT! Add mustard, add mashed anchovies but s’il vous plait – do not add sugar! Homestyle (aka made in Grandmère’s kitchen and in every French household I know of) French vinaigrette does not include sugar. For family members on special diets, I’ve replaced herbs and spices with this organic salt-free seasoning for salad dressings and general cooking purposes. And this bottled dressing is the best tasting ready-made organic vinaigrette we’ve found with the lowest sodium content! Any of our salads can be prepared with a simple vinaigrette dressing. Potato salads are scrumptious when the hot potatoes are allowed to soak up a zesty vinaigrette. Add just a touch of your favorite mayo for great flavor. 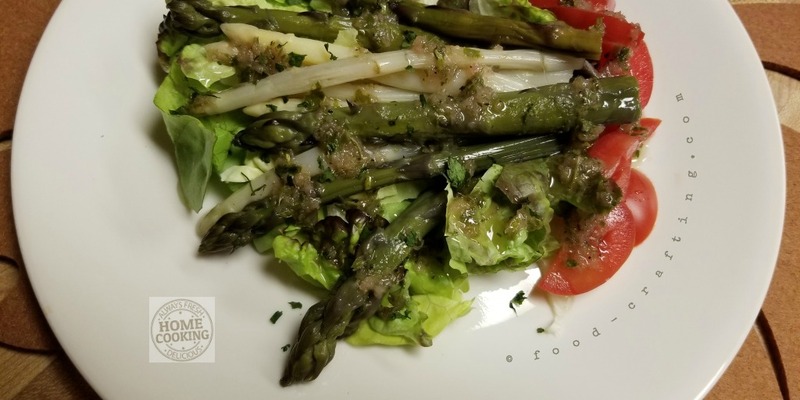 Drizzle an herb vinaigrette over steamed asparagus or plain sliced tomatoes! 3 Every Home Chef Needs A Hand Held Blender!